This was published Jan-Feb 2004, IPCS vol 32, 4. It was in the very early time of Trionfi.com (started 2003) and we had published our extracts of Ortalli's "The Prince and the Playing Cards" inclusive the important note of 1457, in which the two decks with 70 cards were noted. ... but possibly we had it already some time earlier at our old geocity-site. Possibly our activities had triggered the new interests in the early Tarot. We had then contact to John McLeod, who was close to Dummett in that time. ... and the IPCS published posthum something of his work, possibly the last contribution of John Berry. In this article he took a position close to ideas of the 5x14-theory. In an earlier Book Review to Bob O'Neill's Tarot Symbolism of c. 1989 (? I have to look it up) he already expressed this position. Possibly the article of 2004 was an indirect reply to Dummett's new theory, published Jan-Feb 2004. Dummett presents the idea, that there once had been early a card deck with 18 trumps. The Fool and the 3 virtues are missing in this concept. The starting point is observation of the different positions of the 3 virtues in the different orders A, B and C.
As I don't remember to have read this idea elsewhere, I think, that this perspective of Dummett stayed more or less unknown. Here's the 2nd starting point, the confusing 70-cards-note from Ferrara, which somehow kills the older theories about the origin of the Tarot cards (Tarot development was finished in 1450). 8 cards are missing. Dummett thinks of the 4 queens as the first 4, although Brera-Brambilla and Cary-Yale Tarocchi already had queens. Dummett assumes, that the other 4 cards should be Matto and the 3 virtues, which runs in the contradiction , that a Matto had been part of the PMB and that the PMB was considered to have been produced early in the 1450s and the Ferrarese date is 1457. In a later article (not in the IPCS magazine) Dummett had changed his opinion again. He assumed then, that the whole PMB was made in the early 1460s and that Bonifacio Bembo and one of his brothers worked together on the deck. Possibly with this specific problem about the Matto started the other, later opinion. Dummetts speaks about the Cary-Yale Tarocchi and interestingly there is no word about his earlier 25 trumps suggestion. ""We do not know the full composition of the trump sequence in this pack." Dummetts stands (in the yellow part) before the 5x14-theory ... as we will read he'll not decide for this solution. Possibly it would have helped him, if he had simply analyzed the (later) numbers of the 14 cards in the group of the first painter. I personally think, that this strange number row is much more secure in favor of the 5x14-theory than even the argument about the document of 1457. Sure: The document of 1457 has the advantage, that everybody understands the situation, which is more difficult in this other consideration. The Cary-Yale-World looks more like "Fame" than "World" with its winged trumpet. Anyway, Dummett decided for an early 18-trumps-deck at this occasion. Later, obviously not satisfied, he changed to 2 artists in the 1460s, both working at the same time. I think, I didn't know this article before I detected it today with some surprise. But it's so long ago, that I can't rely totally on my memory. Well, a pity. If there would have been a little more contact between the group LTarot and IPCS, life might have been more interesting and amusing. .... was shown to Dummett in private letter communication. At that time the document of 1457 wasn't known, at least not to us. 3.2 Tractatus De Deificatione Sexdecim Heroum. The pack was painted for Filippo Maria Visconti by Michelino, but the actual treatise was written by Marziano da Tortona in the 1410s. This case is unique among the sev­eral indicated here - the con­nection with tarot is not a speculative one: we are in the presence of the earliest tarot pack or at least a quasi-tarot pack(6), here both book and cards are real, even though somewhat out of the ordinary and deserve further comment. We have sixteen personages, all gods or mythological personages, which are originally struc­tured: they belong to four suits; however, their hierar­chical order is not dictated by these suits, but proceeds continuously across them. We can thus forget that there are four groups of four cards and consider the set as a new series of orderly triumphs increasing in power from 1 to 16. We have here a systematic set, but it does not cover the whole standard series of tarot 0-21 triumphs. The six lacking cards could not be added by following the same scheme because it is not possible to add three halves of court cards to each suit. The overall correspondence with the standard sequence is not yet satisfactory, but this source-book may provide an explanation for the manner in which the triumphal cards were inserted into the pack(7). We can think of several evolutionary steps leading to tarot. For instance, eight emperors added as higher courts; a different pack with a fifth suit consisting of ten pips and eight higher cards; four of the higher cards en­tering among the standard courts; a temporary pack consisting of five suits of 14 cards each; the addition to the latter of an­other set of eight major triumphs. The fact is that initial packs of 70 cards are documented(8), as well as the peculiar Marziano series of 16 person­ages. 6. F. Pratesi, The Playing Card, 18 (1989) 28-38. 7. M. Dummett, The Playing Card, 18 (1990) 73-75. 8. G. Ortalli, Ludica, 2 (1996) 175-205. One may note, that Franco Pratesi at this passage referred to the possibility of 5x14 decks in the Tarot development, though not in context of the PMB: " a temporary pack consisting of five suits of 14 cards each". 70. I trionfi di Marziano. The Playing-Card, 28 No. 3 (1999) 144-151. This was Franco's last contribution before he took a longer pause from the playing card scene. alla nuova tradizione. Una conferma indipendente si ricava dall’Archivio estense dove sarebbero citati antichi mazzi di trionfi di 70 carte (Footnote 3). Esaminiamo allora la possibile composizione di questo insolito mazzo, pur riconoscendo che questa discussione è inevitabilmente di carattere speculativo. ogni seme superano le dieci carte numerali. dei quattro semi al nuovo seme dei trionfi. prov. Mod. e Parm. 7 (1874) 123-132. 4. M.Dummett, “A Comment on Marziano”. The Playing-Card XVIII (1989) 73-75. This time he gives not Ortalli's article as reference, but the earlier note of Campori. Thanks very much for bringing this 2004 article by Dummett to our attention, Huck. What I find most admirable in it is its methodology. He examines various possible possibilities and proceeds to eliminate the ones contradicted by the facts or otherwise to be rejected as implausible. In so doing his hypotheses range far beyond the known facts. Whereas in Game of Tarot he for the most part stuck to facts as the basis for hypotheses, here he is going far beyond facts into possibilities. Hypotheses do not come from facts; they are possibilities imposed upon facts, as the most plausible of various alternatives allowed by the various facts, including those seemingly unconnected to the hypothesis. From the possibilities he eliminates those that are implausible. In the process he drops a former hypothesis--indeed, certainty--that the number of special cards was always 22. And he has no qualms about speculating that the tarot was invented in 1420 Milan, despite the fact that the earliest available date when he was writing was 1442 Ferrara, based on a purchase from a Bolognese merchant, and (apparently) the rule of thumb that we have to allow at least 15-20 years between the invention of something and its being written about, in that epoch. That is also while knowing nothing whatever about the structure of the tarot at that point, and hypothesizing nothing more than the three sections of the order. That we now have one more fact, of a deck called "naibi a trionfi" being made in 1440 Florence, for a notary in Anghiari, does not change anything. 1440 is only 2 years before 1442, rather insignificant compared with 20 years of development. Nor does its being in Florence rather than Ferrara. Neither is rather close to Milan, although either is within a day or two's reach of a condottiere switching employers. Both the elements "Milan" and "1420" are rather distant from the facts, but not from the logic of realistic possibilities. This article is immensely helpful for freeing us from the shackles of crude empiricism, as opposed to an empiricism based on the understanding that the past, together with the spatial configurations that play out in it, is a grid with some spaces filled in empirically but much of it blank (as Dummett in his later philosophical works explicitly states for our ordinary conception of space and time, explicitly correcting his earlier approach). The historian then does what he or she can to infer the unknown from the known, as one art historian put it (I forget his name, but he said it so emphatically he must have been criticized for it; it was in the course of reconstructing the layout of Giotto's destroyed frescoes for the Carrerra palace in Padua). Another victim of Dummett's later approach, however, is the appeal of the 5x14 hypothesis itself, at least for the PMB. A major part of its appeal is that 14 special cards empirically exist in the PMB. But the 14 are just part of a grid with at least 8 spaces blank, in the sense of not knowing whether any card fills that space or not. As for the 5x14 in Ferrara, that remains appealing, due to the 1457 document and the "14 figures" of Jan. 1 1441. But the "14 figures", while for Bianca Maria, were a present from Leonello. Ferrara is not Milan. Both are parts of a grid extending geographically from Florence to Ferrara to Milan, and in time from 1420 to 1440. Nonetheless Dummett's logic does come to the 5x14 theory's aid. It is more plausible that the the 8 hypothesized as missing cards are the very ones that the PMB second artist painted, plus the Devil and the Tower, than that they are the 3 virtues plus the Fool and the Queens. That is because the Fool, Justice, and the Queens already existed in the PMB first artist cards. If they existed in Milan, they probably existed in Ferrara. Not much is settled by this argument, however, because if the PMB first artist were just a little later than 1457, the main leg of the argument would disappear. But it is nice to see Dummett seriously entertaining the 5x14 theory. And I for one don't think that the PMB first artist cards are later than 1457. I don't think they are later than 1455. Bonifacio was too busy in Milan and Pavia, painting no longer extant works. It is also nice to see that Dummett let go of his idea that just because the CY had 7 virtues, and definitely the cardinal virtue of Fortitude, the PMB must have had Fortitude as well, and so probably also Temperance, since the three are so standard. For him it is because the CY is just too non-standard. I doubt that, but it is nice to see him being flexible. I have another argument to the same effect. If the PMB [error--I meant CY] had 16 special cards for 16 cards per suit, a tarot deck with 14 cards per suit might have had 14 special cards. If so, it would have had to drop 2 of the CY's cards. Since Temperance and Fortitude are both absent from the PMB first artist extant set, that is a reason for supposing that those two were the ones that were dropped. A structure for the 1457 decks that Dummett did not consider is one suggested by Franco somewhere: that there were 22 special cards plus 4 suits of 12 cards each, omitting two of the numeral cards. Apparently 48 card packs were not that rare. So why are the virtues so various in the orders? The answer is probably lost forever. Here is one hypothesis, far from Dummett's considerations: people had reasons for making changes, based on a local desire to be different and different ideological considerations of the rulers. Borso loved Justice, so he makes it high, as high as the Last Judgment. Plato, big in Florence after Bruni translated the Phaedrus (published 1427, done much earlier), had his three parts of the soul, from least worthy to most, each with its virtue, In Milan, influenced most by Petrarch's Trionfi (as seen in the female charioteer of Chastity), different virtues were seen as needed in different parts of life and after, hence the need for spacing them out: justice first, because fortitude is wasted in an unjust cause. And Temperance in one's passions is good in old age and after, both to protect one's frailer body and to wean one away from life, which also holds good when one is a disembodied spirit, wanting to haunt one's former life. Given that Petrarch's poem plays a big part in the construction of the sequence, that is another reason for supposing the Milan order, or something like it, to be first. On the other hand, Temperance might be after Death for some other reason entirely: to make Death number 13 without having to resort to an unnumbered Bagato, for instance. Added later: to put my point in a different way: that the order of virtues is so different in various orders is no more, or less, significant than that the Popess is fourth in Ferrara but second in Milan. In the sequence as a whole, the virtues occur in different places. Within a particular section (as opposed to its ends), one of the triumphs occurs in different places. Each is as little or as much in need of explanation. Surely it is an exaggeration to say that it is pure guesswork to identify cards in decks with a variety of imagery with subjects named in the "Steele Sermon", for most of the early decks. It may be true of the Sola-Busca and perhaps a few other non-standard decks, but not for most. Berry's last sentence is ambiguous. When he says that the quest for meaning, against the background of such diverse imagery, is a waste of time and effort, that could mean the meaning of particular subjects, i.e. "Star", "Moon", etc., abstracted from the particular decks they occur in. Here I think he does have a point. But the sentence might also mean, the quest for meaning of particular subjects in particular decks, i.e. "Conver 1760 Moon", "Charles VI Moon", etc., is a waste of time. I don't think his argument implies the latter. It is like thinking there is a meaning for "Madonna and Child" paintings generally, other than the obvious. That does not negate there being non-obvious meaning in, say, Leonardo's "Madonna of the Rocks", or ones where the Madonna is sad-faced, etc. Actually I had the plan to comment on the yellow passages in John Berry's article of 2004, but I was interrupted in the representation and I noted a small "in work" at the top. So I intend to move the Berry article from the 2nd post to a later post in this thread - with the intention to keep a better overview for later readers. Actually it's better to start the report about John Berry's work with an earlier article of him, in which he made a review of Bob O'Neill's "Tarot Symbolism". This review is more about John Berry's own theories than about Bob O'Neill's work. It's from IPCS XV/3/95-9, so produced February 1987 and so long ago. John Berry is then already close to the 5x14-theory. Many people had asked him about his opinion about Tarot, he states. And that, what he tells in the 2004 article is very detailed. Hardly this could be the result of just this 5-pages review about Tarot Symbolism in 1987. Maybe he spread his opinion only by speech or by private letter communication. Ha ... after being confused by this point a longer time I read in the Editorial of the issue, written by Michael Cooper: "In this edition is the last article written by John Berry; it is sad that he didn't live to see it in print." Well, I note, that in the 2004 article there is no word to the document of 1457, something, which Michael Dummett caused two editions before (Jan-Feb 2004) to speculate about an 18 trumps Trionfi deck. John Berry would have realized, that this is a strong confirmation for his long-years theory. Articles for the IPCS are often not immediately published, but have to wait. Possibly John Berry wrote before Dummett. John Berry started his 2004 article in a manner, as he would have more to say than 1 1/2 pages text and a further page filled with footnotes ... at least that was my immediate impression, without knowing about Dummett's article two IPCS editions before. Actually one should become sure, if these both articles are really all, that he had written in this direction. But I've no idea, where to search for it. Thanks, Huck. These three articles together make a very good starting point, not in general outmoded by information since. It's a great pity that John Berry died when he did. Berry thinks the Justice card is more ineptly done than the rest of the PMB picture cards. That is an interesting point that I have not seen discussed. Bandera and Tanzi did not say anything about it in their 2013 exhibition catalog. I don't know what to think. If true, Bandera's and Tanzi's essays in the catalog might offer an explanation: there were two artists for the 14 "first artist" cards, not one. Although most of the picture cards (as opposed to the numerals) were done by Bonifacio, Justice might have somehow got done by Ambrogio Bembo. Perhaps the commissioner (Bianca Maria?) got the idea of the horse and rider at the top after Bonifacio had finished his part and gone on to commissions out of town. So Ambrogio re-did that card. That is of course only one possibility, but a reasonable one. My own hypothesis is that Justice is meant to be Bianca Maria, and the knight on a white horse Galeazzo Maria. He is shown on a white horse in the "Adoration of the Magi" painting in Florence, 1459, so perhaps that was a trademark of his. Galeazzo Maria of course did not fulfill Bianca Maria's expectations; he apparently didn't like being defined by his mother. mikeh wrote: Berry thinks the Justice card is more ineptly done than the rest of the PMB picture cards. That is an interesting point that I have not seen discussed. Justice as a single virtue in a 14-cards-model is strange, though in general art virtues don't appear always as a group. An explanation might be the scene in one of Christine de Pizan's works, where she presented a goddess of Justice for love affairs. Christine de Pizan was promoted at the Valentina Visconti court. Valentina had been the logical great woman in the Visconti-family before Bianca Maria herself. Christine and Valentina stood for "women liberation" and "rights for women". Bianca Maria as Visconti heir stood socially higher than her husband, somehow as a "female ruler" in Milan. Jeanne d'Arc some time later than Valentina and Christine impressed the French world and likely not only in France. The Cary-Yale, likely produced short after Jeanne d'Arc, included female knights, possibly referring to Jeanne d'Arc. Filippo Maria with his 16 gods in the Michelino deck somehow had reacted on the 16 gods in the work of Evrart de Conty (1398), the "Eschecs amoureux". The work clearly related to chess. Evrart de Conty had taken strong connections to the "Roman de la Rose" of Jean de Meung, who had presented a very "male view" of the world, which got heavy attacks in the female world of Valentina's court (especially around 1402-04). So also the work of Evrart de Conty got there negative reactions. France had a very weak king (Charles VI) and with some internal logic there were stronger women at the same time. Christine's work made an impact on the run in French literature till the 1420s till Jeanne d'Arc (especially by Alain Cartier; earlier discussed here). He used the terminus "Dame France" and formed an archetype of the "cruel women". Northern Italy had less respect for the female role and in Milan and Ferrara women at the throne were killed for adultery. Alain Cartier, who worked as a diplomat for the very weak French state in the early 1420s, had contact to Filippo Maria Visconti (possibly in the time, when the Michelino deck was produced). Filippo made with a Michelino deck a construction around a classical "cruel woman", Daphne, who preferred to become a tree instead satisfying her lover Apollo. The Justice in the PMB has a strange background, we cannot rely on the idea, that it is a "common cardinal virtue". If we assume, that the early PMB was made 1452 (Malatesta's letter), then we have the strange meeting of events, that Borso d'Este in his triumphal celebrations for the duke titles of Reggio and Modena seemed to have shown his first special interest for the virtue Justice (May 18th in the same year ? I'm not sure about the date). A knight on a horse with a drawn sword in the background of Justice does not look typical for the cardinal virtue justice. It's more the love affair of Bianca Maria, who gave her hand to the knight Sforza (of low birth, but excellent by his military successes). I can't contribute to the idea, that this card is "more ineptly done than the rest of the PMB picture cards". I don't see that. Perhaps it is clear, when one has the opportunity to study the cards directly. If it is real, there might have been the chance, that this card was replaced from another deck with lower quality. We know, that this deck type was variously copied, often with a loss of quality. Leonello in 1442 ordered directly 4 decks, perhaps then also other copies of minor quality were done outside of the account books. In the research situation 2003 one could keep oneself to the position, that then nearly all known documents referred to the higher noble market, and that possibly not much decks existed in the 1440s and 1450s and perhaps even in the 1460s. This time is gone. With Franco Pratesi's research of 2011/2012 and Arnold Esch's short article to playing cards imported to Rome in 2013 we know, that there was a big increasing stream of Trionfi card production already in the 1450s and for that we have to calculate also a lot of more variations in design and also in quality. Naturally the strategy of "rough estimation" might be easily go totally wrong, when we assume, that the case "documents without number of decks" was very often related to cases "when it was too difficult to count", in other words, "when it were many decks" and/or "when it were cheap decks". So there are a lot of open questions about these documents. Possibly some would become clearer, if a competent playing card researcher would visit the document passages in the archive. I have another comment on Dummett's 2004 article. 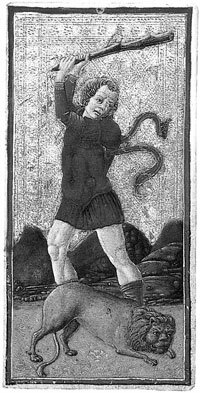 He assumes that the cards Devil, Arrow/Fire, Star, Moon, and Sun were all present in a period before the virtues were present in the Milan cards. That is illogical, in light of Franco's and Esch's data. Dummett's basic explanation for the variation in trump order is that it was a result of people in different areas not knowing the exact sequence in the other areas. However the Devil-Sun part of the sequence is invariably in the same order in all regions. That speaks to its being late, when cities would make cards for use in other cities (e.g.. Florence as a major producer), and so they knew each other's order and were moving toward standardization. This would have happened at least after the Peace of Lodi, 1454 (https://en.wikipedia.org/wiki/Treaty_of_Lodi), when trade among regions was more secure. The Esch-Franco data seems to confirm this. On the other hand, since the virtues are all over the place, they are early, at least compared to the Devil-Sun part. If so, including all 7 virtues but excluding all but one of Devil-Sun (5 cards; I allow two because Moon-Sun would be a natural sequence) and the Fool, we would have 19 possible trumps (25-6), with 11 verified, for the Cary-Yale itself. It seems reasonable to me that 5 of the missing 8 were not in that deck, although we don't know which ones; that would make for the 16 indicated by the number of regular suit cards and by the Marziano deck. It might also be reasonable, based on the later standard number, that Moon-Sun was seen as a natural sequence, easy to remember, making as many as 21. But 25 seems to me quite implausible, because of the difficulty in explaining why Devil-Sun is somehow, out of all the cards, the only invariant part of the whole sequence. .
1. Two trumps are missing, Tower and Devil, so there is no way to know by whose hand those were painted - a 14 card set of trumps is necessarily suspect . 2. The 14 trumps by the original painter represent a complete set of trumps that survived intact, even though no other Visconti/Sforza deck has, nor even the PMB’s pips and court cards? This strains credulity. 3. The Fool is an outlier, so there would have been 13 trumps plus that wild card; 13 is an unlikely number for the suit of trumps. 4. The full sett of cardinal virtues is implied in the same city of Milan’s earlier Modrone deck. And I would argue the theologicals were not unique to the Modrone (“erased” in subsequent decks) but transformed into an antitype or cognates in the PMB: for antitype, Hope->hanged man; for cognates, Faith->“Papess” (really not a transformation, but rather Franciscan attributes added) and Charity->Pope (this latter identification is the most controversial but of the seven virtues, Charity is centered over the heads of both Sixtus IV and Innocent VIII on their tombs; see Allison Wright, The Pollaiuolo Brothers: The Arts of Florence and Rome, 2005: 379 and 405, respectively, for discussion of each pope’s tomb and the Papacy’s claims in general on the virtue of Charity). 5. The PMB’s justice is clearly derived and dependent on Giotto’s use of Justice in the Scrovegni chapel in which it figures amongst all seven virtues (notably, with matching antiypes, such as the hanged person opposite Hope). 6. Its hard to imagine the PMB Justice singled out by the designer as the single-most important Virtue when the Judgment trump shows God holding the sword in the same exact same attitude as Justice (the swords can be mapped over one another). 7. The PMB Justice is not necessarily “inept” (Berry’s words) but shrunken to accommodate a clear reference to the black armored suit of swords (minus the coat of arms, the rider above Justice is essentially the same as the blonde/black-armored Knight of Swords, with both horses wearing an armored headpiece and a caparison embellished with rosettes). WHY? Obviously it links Justice with the ruling house of Milan: the Sforza. Regarding this last point, the pivotal clue is the inexplicable and otherwise unexplained coat of arms on the shield of the highest card of the Sword suit: Venice’s Lion of St. Mark. To deny that this is a clear reference to Venice is to wilfully ignore Sforza’s long term relations with the Serenissima. And what is the famous hallmark of Venice’s foreign relations with the rest of Italy and her client cities? VENETIAN JUSTICE. (Venice/Justice, 1421, Jacobello del Fiore). but into the building itself, where, still seated on his horse, Francesco was hailed on all sides as Duke” (C. Ady, A History of Milan under the Sforza, 1907: 60). 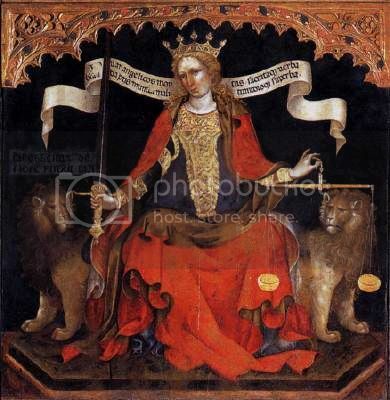 Note that the tooled trefoil about Justice can be easily likened to the doors of a cathedral – the very same Cathedral where the banners of St. Mark (i.e., Lions) were placed by Sforza after he captured them at his victory at Caravaggio in 1448 (Ady, 46). Sforza is clearly mocking the double-crossing Serenissma in the King of Swords, a polity that not only lied to him but whom he humiliated on the field of battle, while promoting himself as a just ruler in the Justice trump (similarly, the PMB’s “World” card is the well-ordered city – an idealized and rebuilt Milan as a New Jerusalem – that would flourish under his dynasty; the two putti could reference his two sons born to that date). •	December 1449 Venice recalled her ambassadors from Sforza and reconfirmed its alliance with the Ambrosian Republic (King, 1994: 275). This has to be the terminus post quem for the PMB. •	October 1452 letter from Francesco Sforza to Antonio Trecco asking for "uno paro de carte da triumpho" for Sigismondo Malatesta. Likely the terminus ante quem for the PMB – its hard to imagine an entirely different tarot creation in such a short time period given Sforza’s strained financial position (he needed to pay off lieutenants, not purchase works of art); all of the surviving PMB-esque fragment decks suggests reiterations of an original creation, some with alterations. •	March 1455 Colleoni was officially awarded the baton of command to become Captain General of Venice and this is the absolute terminus ante quem for the PMB, as after that date there is no longer an intended target for the “irony” of Sforza holding the Venetian shield, nor any other fathomable purpose for the Lion of St. Mark within the PMB. P. 97 of the O’Neil review of Berry you posted above, it is noted the PMB Strength card is simply that and “not, surely, Fortitude”, although I would argue there is a conflation of those two related concepts here. 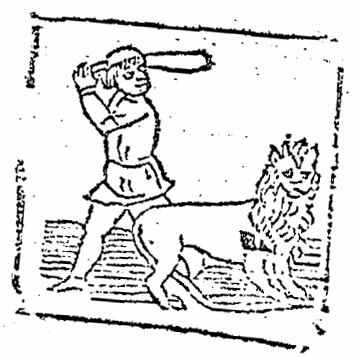 The emphasis on “Strength”, however, points to Sforza’s own name in this card, and to say it again, the unique PMB Force/Fortitude card simply amplifies the message of the Justice and King of Swords cards: Sforza-as-triumphator, here, over a cowering lion, the symbol of duplicitous Venice. The bottom line: the number of surviving PMB painted by the first artist needs to be divorced from any notion of an earlier 14 trump deck as there is no reason for Justice to be singled out any more than the Virtue closer to Sforza’s name, Strength/Fortitude. What marks the Justice card of the PMB as derived from the Giotto in particular, given that it is a standard image used throughout the Middle Ages? That is precisely one thing that marks Justice out as the most important virtue: it is the one that comes into play at the Last Judgment, which determines the future eternal life of all humanity. Probably for that reason, Justice was put as the second highest triumph in the order of Ferrara. Also, Justice is what guides Fortezza, so that it does not turn into destabilizing vengeance that only breeds more vengeance. Justice is what secures the peace, a stability that Francesco Sforza, as well as his friend Cosimo de' Medici, valued above all else and worked to secure in the Treaty of Lodi. Milan was not in the same position as Florence with regard to the Pope's charity. Florence's bankers served the Pope', for which they received a generous commission (I am not totally sure how many firms were involved, but I would expect at least the Medici). However, the Pope had acted exceedingly uncharitably with both Milan under the Visconti (as an ally of Florence and Venice) and with Francesco Sforza in particular, given his excommunication for refusing to hand back territory to one pope that he had been given, for services rendered, by another. An alternative hypothesis for transformation is that of Hope into the Star, as the card is visually similar and connotes the Star of Bethlehem, the hope of humankind; Faith into the Moon, also for its visual similarity, as well as being the virtue that sustains one through dark times; and Charity as the Sun, also similar visually, with the sun being an exemplar of charity in giving its warmth and light unflaggingly without any expectation of recompense. In the Minchiate, the theological virtues are in the same order: Hope, Faith, Charity, suggesting that the same was true in earlier decks with those virtues. • March 1455 Colleoni was officially awarded the baton of command to become Captain General of Venice and this is the absolute terminus ante quem for the PMB, as after that date there is no longer an intended target for the “irony” of Sforza holding the Venetian shield, nor any other fathomable purpose for the Lion of St. Mark within the PMB. For that card perhaps (the King of Swords), but surely not for the six cards by the other artist. A Fortezza (fortitude, force, strength) card in Milan can reference Hercules without necessarily implying Venice, although since Venice (and the Pope) broke the Treaty of Lodi in 1483, it might help to remind people of Venice's lack of invincibility against the Sforza. There is no reason to assume that the card was painted before that date, given that the style is so similar to that of Cicognara, whose first known works are c. 1480. Tanzi in the 2013 Brera catalog for the exhibition that included this card says in fact that art historians are unanimous in attributing the second artist cards to Cicognara, whose first known works were c. 1480. I myself would not rule out an earlier date, since the style is also similar to that of the Belfiore Muses and to the Schifanoia.